It looks like Canon underestimated the demand for the EOS 6D Mark II + EF 24-70mm f/4L IS USM kits. 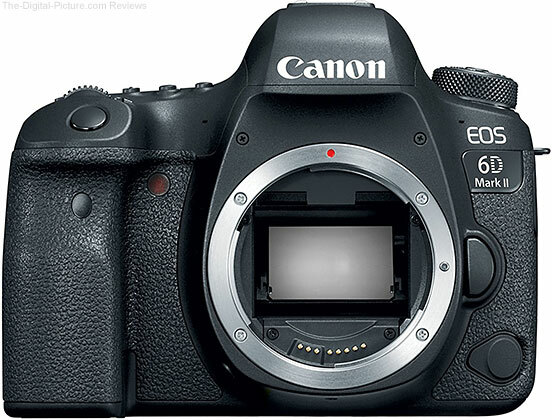 In a recent statement, Canon Japan admits that orders have exceeded supply and that the kits won't likely be available on August 4 as originally intended. The Transportation Security Administration recently modified their screening procedures so that travelers will now have to remove items "larger than a cell phone" – including DSLRs and mirrorless cameras – from their carry-on bags and place the isolated items in bins for separate screenings. The new standard screening procedure will surely be an inconvenience to most photographers, especially as the rules regarding "electronics" may seem a bit ambiguous. For instance, during a call with the TSA this morning, the service representative could not provide a definitive answer as to whether or not lenses would also have to be removed with each being put in a separate bin, ultimately advising that the procedure for lenses would be determined by a TSA checkpoint agent at his/her discretion. Few (if any) photographers will want to place each individual camera and lens into separate screening bins because of the increased screening time and frustration and increased probability of lost/stolen/mishandled (dropped) gear. Thankfully, there's a relatively easy (though not free) way to avoid the complications of the new screening procedures – get TSA PreCheck certified. Not having to remove shoes, laptops, camera gear, 3-1-1 liquids, belts and light jackets. It takes five minutes to submit an online application and schedule an in-person appointment that includes a background check and fingerprinting at an enrollment center. The cost of receiving PreCheck benefits varies depending on the program you wish to qualify for. The regular TSA PreCheck certification costs $85.00, lasts 5 years and is available for U.S. citizens and U.S. lawful permanent residents. For $15.00 more, you can choose the Global Entry program which receives the benefits of TSA PreCheck plus "expedited processing through CBP at airports and land borders upon arrival in the U.S.," but also requires a passport or other lawful resident card for the application process. If planning on traveling outside the U.S. within the next 5 years, the extra $15.00 will likely prove to be a worthwhile investment. To learn about other programs which receive TSA PreCheck benefits, click here. Note that if your application is denied for any reason, the application fee is not refunded. Applicants may be ineligible due to incomplete or false application information, violations of transportation security regulations, or disqualifying criminal offenses and factors. The name on your application must be an exact match to the name on the identification and proof of citizenship/immigration documents you provide at enrollment. The name provided must be the name used when making your airline travel reservations. Participating airlines print a TSA PreCheck indicator directly on your boarding pass if you are eligible for TSA PreCheck on that flight. In addition to the indicator, TSA PreCheck eligibility is embedded in the barcode of the boarding pass. Once the boarding pass is scanned at the checkpoint, the TSA officer may refer you to the TSA PreCheck lane. If you do not have a valid boarding pass with TSA PreCheck embedded in the barcode, you cannot access the TSA PreCheck lane. Not all airlines participate in TSA's PreCheck program. See the participating airports and airlines map for more information. The TSA notes that PreCheck appointment times are filling up and advises applying now if traveling in the next few months. This little green heron was hunting for early morning breakfast in a relatively thick-growth area over shallow, duckweed-covered water. While the bird was not at all concerned about my presence, I was struggling to acquire a clear view of it, and finding a good body angle along with a pleasing background aligned within such an opening was especially challenging. When the bird hopped up onto this dead limb and walked to the end of it, pausing to determine its next move, I at least had a few seconds with a relatively still bird. And at that moment, I had two of those three goals met. The heron was horizontal to the camera and the background was distant with good color. The foreground obstructions were the remaining issue. I shifted my position enough to get a clear view of the bird's head, focused and held the shutter release down for a short burst (always photograph birds in high speed burst mode as you, minimally, never know when a nictitating membrane is going to come across the eye). When reviewing the result, I was pleasantly surprised to see how well the Canon EF 600mm f/4L IS II USM Lens faded the foreground obstructions into a "dreamy" look. Note that calling any kind of photo effect "dreamy" always put a positive spin on an effect that might otherwise be used to downgrade an image, but ... I do like how this one turned out with this photo having a unique appearance. The lighting conditions for this shoot were ranging from direct early morning sunlight to full shade. I was using Manual exposure mode with the aperture set to wide open (f/4) and ISO set to Auto, allowing the camera to adjust to the lighting conditions as needed with me adjusting the exposure composition as lighting situations required. While shooting, I could quickly adjust the shutter speed by simply rolling the top dial. When the bird was about to strike at prey or otherwise move, I quickly selected a fast shutter speed (such as 1/1600 or higher). Of course, when the subject was in full shade, as seen here, 1/1600 meant a very high ISO and that of course means higher noise level in the image. When the bird paused at the end of this dead limb, I quickly rolled the shutter speed down to 1/400 with ISO 2000 being camera-selected. Full frame ISO 2000 looks great. 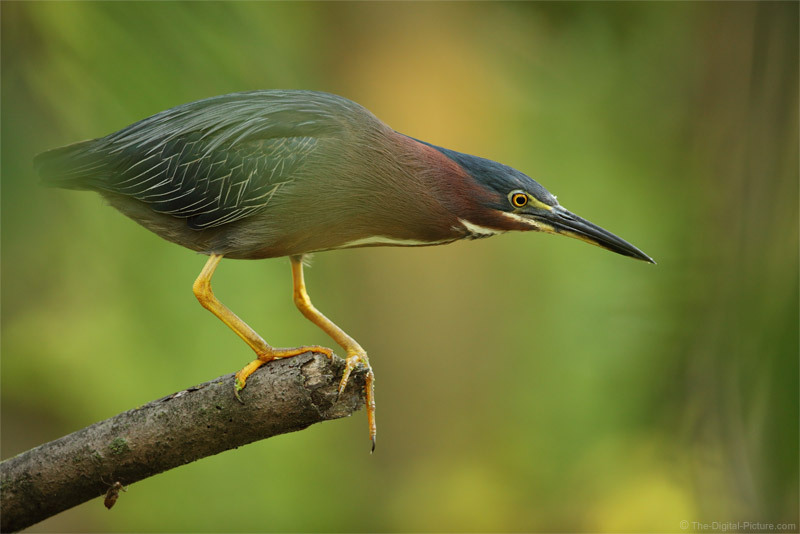 And, that is my little green heron story for today. A larger version of this image is available on BryanCarnathan.com, Flickr, Google+, Facebook and 500px. Image quality results from the Canon EOS 5Ds R have been added to the Sigma 14mm f/1.8 DG HSM Art Lens page. I had high expectations for this lens, and it indeed appears to be an optically-great one. I was viewing lots of comparisons and thought I'd share many of them. The Sigma has a moderately high price tag, but these results show that you get (at least) what you pay for. 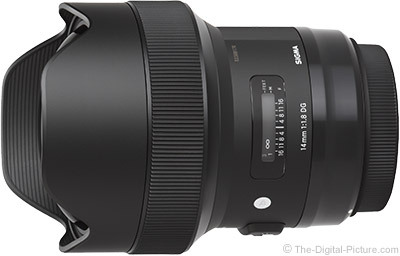 The Sigma 14mm f/1.8 DG HSM Art Lens is in stock at B&H | Amazon | Adorama. Adobe is Killing Flash, Is Your Photography Website Ready? Adobe has announced that it is ending support or Flash, a plugin technology that – although outdated – may still be an integral part of many photographers' websites. Thankfully, those photographers have ample time to update their websites using alternative natively supported technologies. But as open standards like HTML5, WebGL and WebAssembly have matured over the past several years, most now provide many of the capabilities and functionalities that plugins pioneered and have become a viable alternative for content on the web. Over time, we’ve seen helper apps evolve to become plugins, and more recently, have seen many of these plugin capabilities get incorporated into open web standards. Today, most browser vendors are integrating capabilities once provided by plugins directly into browsers and deprecating plugins. Several industries and businesses have been built around Flash technology – including gaming, education and video – and we remain committed to supporting Flash through 2020, as customers and partners put their migration plans into place. Adobe will continue to support Flash on a number of major OSs and browsers that currently support Flash content through the planned EOL. This will include issuing regular security patches, maintaining OS and browser compatibility and adding features and capabilities as needed. We remain fully committed to working with partners, including Apple, Facebook, Google, Microsoft and Mozilla to maintain the security and compatibility of Flash content. [To see each partner’s announcement on this news, click on the links inside each partner name.] In addition, we plan to move more aggressively to EOL Flash in certain geographies where unlicensed and outdated versions of Flash Player are being distributed. Adobe will also remain at the forefront of leading the development of new web standards and actively participate in their advancement. This includes continuing to contribute to the HTML5 standard and participating in the WebAssembly Community Group. And we’ll continue to provide best in class animation and video tools such as Animate CC, the premier web animation tool for developing HTML5 content, and Premiere Pro CC. Looking ahead, Adobe will continue to provide the best tools and services for designers and developers to create amazing content for the web. Permalink: Adobe is Killing Flash, Is Your Photography Website Ready? In today's tutorial, I will show you how to fix the electric blue color cast in both Adobe Camera Raw (or Lightroom) and Photoshop! Lightroom tips and tricks in 60 seconds or less from longtime Lightroom team member Benjamin Warde. 07/27/2017 – Our largest rolling photography equipment case, the Production Manager 50, has been honored by Professional Photographer magazine as a 2017 Hot Ones. The Production Manager 50 is designed to hold an immense amount of gear, including lighting equipment and large light modifiers. 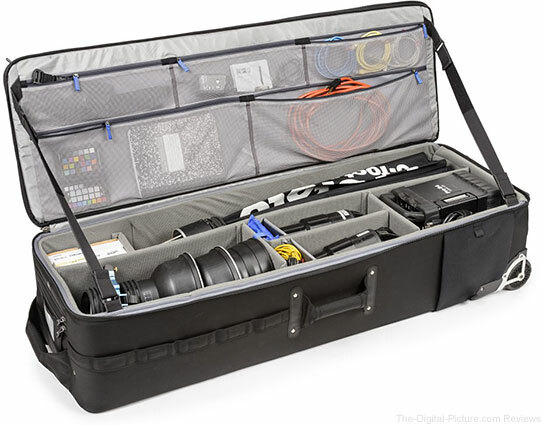 It features stabilizing, wide-set, shock-absorbing wheels that roll smoothly and hold up under the toughest conditions, the ability to lock the main compartment and secure the bag with the included lock and cable, and a fully customizable interior with dividers to protect small and large lighting equipment including c-stands and large modifiers. This year marks the 18th edition of Professional Photographer magazine’s Hot Ones. The official magazine of Professional Photographers of America, Professional Photographer helps readers advance their businesses and careers through editorial content that addresses the artistic, technological, and business aspects of their work. For more than 100 years, pros have relied on Professional Photographer to deliver the education and inspiration they need to be successful: practical lessons and of-the-moment images that define an industry. Think Tank Photo carries the Production Manager 50. Canon has released their finanicial results for 2Q 2017. See below for more information. A few months ago, I reviewed the RigWheels RigMount X4 Magnetic Camera Platform, a device that allowed me to safely and securely mount a DSLR to the hood (or just about any other metal part) of a car for capturing dynamic, in-motion automotive imagery. While RigMount platform works perfectly as designed, I became interested in other tools used for similar automotive photography, specifically boom rigs. The "relatively economical" portion is just that – relative. As I had several of the components that I would later employ in my boom setup, the investment cost for me was less than it may be for you, if you don't currently have any of the components conveniently at hand. Before I go on, let me be absolutely clear – use of a car boom rig involves a certain amount of risk. In other words, you could damage your camera if a suction cup fails, you could damage the car's paint job with a high-strength suction cup and you could easily injure yourself or someone else if they were to get clipped by the boom during a moving photo capture. Proceed with caution; we are not responsible for property damage or injury which may occur as a result of using the gear or techniques described below. Of the components listed above, I already had the ball head, Arca-style clamps/plates, Manfrotto counter balance weight and two super clamps, making the total investment in new gear relatively reasonable. However, even at full cost for all of the components listed above, you'll likely be spending significantly less compared to a specially designed car photography boom rig setup. Because I loathe having to screw ball heads onto surfaces over and over again, I've installed a quick-release plate onto one particular ball head so that I can quickly be swap the head between various rigs. With a clamp installed on a super clamp, affixing or removing the ball head takes all of 2 seconds. Note that one of the Arca-style plates listed above is installed on the camera, with the other (as previously mentioned) installed on the base of the ball head. Typically speaking, I have a battery-grip and an L-bracket installed on my DSLRs. However, wanting to reduce the overall weight hanging on the end of the boom, I opted for exchanging the battery grip and L-bracket for a traditional Arca-style plate. And yes, being roughly 13 years old now, the paint is peeling on the right side of the windshield and the paint on the bumper seems to have faded at a much faster rate. Just after taking the picture above, I disassembled the setup and then recreated it on the passenger side to avoid capturing the peeling paint on the driver's side. I adjusted the front bumper's color in post-processing. I originally purchased the 96" (8') regular duty closet pole at Home Depot after trying to stress it in store (propping it against a sturdy shelf and pushing on the middle of it) to see if it would flex. A quick test seemed to indicate the regular duty (less expensive, lighter) would work. However, after assembling the components for a test run, I realized that the regular duty pole flexed/bounced a bit too much. Therefore, I bought the heavy duty version instead. When it comes to booms, 8' (2.44m) isn't necessarily all that long. In fact, a longer pole would likely provide more flexibility in positioning with increased rigidity being required for similar performance. However, as my pole isn't sectional (it doesn't break down), getting anything larger would have required a different vehicle to get my boom to the shooting location. As it was, I was still required to drive to the location with my passenger-side window down with the pole sticking out several inches (I forgot to close the window when capturing the shot atop this post). 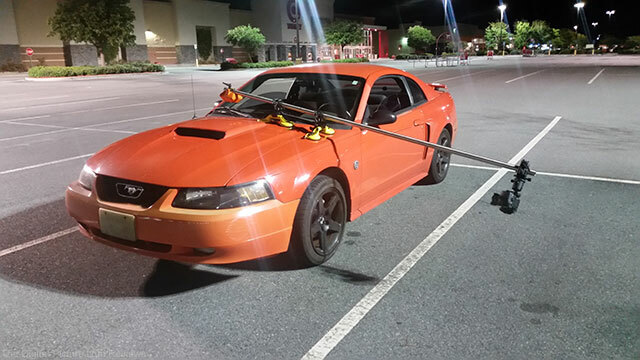 Something to keep in mind in regards to boom poles, as the market for car rig photography is relatively small, I don't think anyone is designing boom poles specifically for the purpose. As such, even companies that are selling car boom rig kits are sourcing their boom materials from other companies who design them for other industries. As such, poles designed for windsurfing masts or other similar products could also be used. In fact, you may even be able to purchase your boom pole directly from a tubing manufacturer, with a wide range of materials and specifications to suit the purpose. When affixed properly to flat portions of your vehicle, the aluminum suction cup holders in the setup above worked quite well in my limited experience (3-4 test runs). Depending on the shape of your vehicle, though, finding flat enough areas for optimal suction can be challenging without articulation between the two handle-connected suction cups. An even more versatile (and more professional-looking) solution would be to use Avenger F1000 Pump Cups, high-power 6" suction cups with a baby swivel pin. Using the Avenger F1000s would require a smaller flat working area and would eliminate two of the super clamps needed in my particular setup. Another benefit of the F1000s is that there is visual confirmation of proper suction, as a red line will appear on the pump when suction is at a critical level (requiring a few more pumps). Be sure to clean your hood of dirt and debris to ensure the best possible connection between your suction cups and the car. Years ago, a photographer friend of mine who used to do these kinds of shots warned me that strong suction cups can damage a car's paint job, so he typically used paint protection film under the suction cups to protect the car's paint job. Also note that suction cup mounted car rigs should not be used in colder weather, as suction cups will lose suction very quickly at lower temperatures. Also pictured in the setup shot above are the Canon EOS 7D Mark II (set to intervalometer mode) and Rokinon 8mm f/3.5 Fisheye lens used to create the final image, with settings of f/5.6, 1s, ISO 160. For the location, I chose to shoot at a large shopping plaza near midnight to ensure I had an expansive open area (parking lot) with almost no obstacles aside from the easily avoidable light poles. 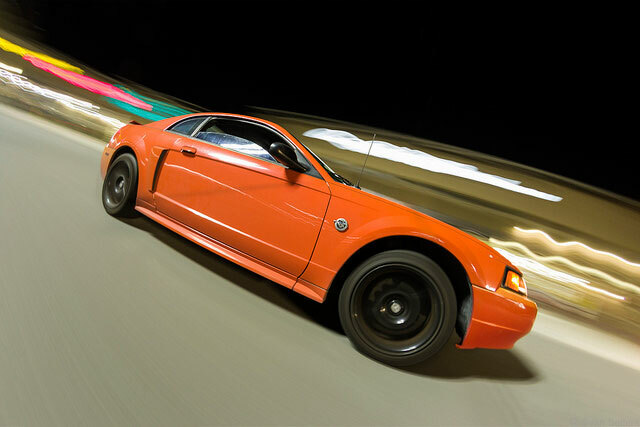 An important thing to keep in mind when creating your in-motion car images while using a boom rig is that you will likely want to remove the boom rig in post-processing. That means that you may wish to be careful how you position the camera and rig so that hard-to-recreate elements of the car are not blocked by the suction cups or boom pole. To keep post-processing requirements to a minimum, I purposefully positioned the camera so that the suction cups could be seen just above the edge of the car. If the camera had been higher, the suction cups would have blocked a portion of the hood scoop which would have been difficult to recreate in post-processing. If you are an expert in Photoshop, you'll likely have more leway in positioning the camera. In post, I applied some distortion correction to remove much of the fisheye look while leaving some of the lens' distortion intact, as well as minor color corrections (including adjusting the color of the bumper) before tackling the boom removal. Here's a before/after shot showing the removal of the boom. After working with the image, I decided that I wanted less tilt and a looser framing. I decided to give Photoshop CC's Content Aware Crop a try to see how well it generated extra space around a significant portion of the edges. I was pleasantly surprised by the results. If I were going to be offering this type of photography to potential clients, I would probably change a few things about my setup and image-capturing procedure. For one, I'd likely use two Avenger F1000 Pump Cups with Baby Swivel Pins for easier positioning of the rig and the visible indicator of proper suction provided by the red line on the pump. I actually own one of those pumps from a project I did years ago, and upon testing it yesterday, it took about 10 seconds to affix to my hood and about 5 minutes of forceful pulling to remove it. Also, instead of having the client actually drive the car with the boom rig installed, I think a better idea would be to push the car and simply use a longer shutter speed for a similar effect. That will reduce vibrations induced by the engine as well as lessen the chance impacting obstacles with the boom with avoidance being even easier at ultra-slow speeds. Of course, those pushing the car would need to remain in an area blocked from view by the car. The TSA has just announced that it will now require travelers to "...remove electronics larger than a cell phone from their carry-on bags and place them in a bin with nothing on top or below, similar to how laptops have been screened for years." Now might be a good time to enroll in the TSA's PreCheck program. WASHINGTON – To ensure the security of airline passengers and the nation’s airports, the Transportation Security Administration (TSA) is implementing new, stronger screening procedures for carry-on items that require travelers to place all electronics larger than a cell phone in bins for X-ray screening in standard lanes. Following extensive testing and successful pilots at 10 airports, TSA plans to expand these measures to all U.S. airports during the weeks and months ahead. Due to an increased threat to aviation security, DHS Secretary John Kelly announced in late June new security requirements for nearly 280 airports in more than 100 countries. In an effort to raise the baseline for aviation security worldwide, TSA continues to work closely with airports and airlines to enhance security measures and stay ahead of the evolving threat. As new procedures are phased in, TSA officers will begin to ask travelers to remove electronics larger than a cell phone from their carry-on bags and place them in a bin with nothing on top or below, similar to how laptops have been screened for years. This simple step helps TSA officers obtain a clearer X-ray image. In standard screening lanes, TSA officers will be stationed in front of the checkpoint X-ray machines to guide passengers through the screening process and recommend how best to arrange their carry-on items for X-ray screening. Travelers are encouraged to organize their carry-on bags and keep them uncluttered to ease the screening process and keep the lines moving. There are no changes to what travelers can bring through the checkpoint; food and liquid items that comply with the 3-1-1 liquids rule, electronics, and books continue to be allowed in carry-on bags. “It is critical for TSA to constantly enhance and adjust security screening procedures to stay ahead of evolving threats and keep passengers safe. By separating personal electronic items such as laptops, tablets, e-readers and handheld game consoles for screening, TSA officers can more closely focus on resolving alarms and stopping terror threats,” said Gowadia. The stronger security measures do not apply to passengers enrolled in TSA PreCheck who are using TSA PreCheck lanes. TSA also marked another milestone earlier this month with TSA PreCheck now available at 200 airports nationwide. Travelers enrolled in TSA PreCheck do not need to remove shoes, 3-1-1 liquids, laptops, electronics, light outerwear, or belts. The program allows TSA to focus resources on passengers who may pose a high risk to security while providing expedited screening to those travelers who have been identified as low-risk, trusted travelers. Note: B&H has the 6D II + lens kits in stock with the body-only still available for preorder. Amazon estimates that the camera may need an extra 1-2 days to ship. Just posted: Sony a9 Review. This camera has features that will leave you wanting when shooting with anything else. 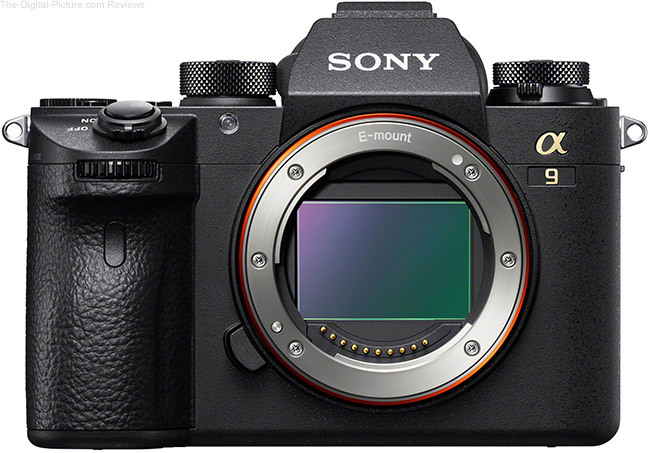 The Sony a9 is in stock at B&H | Amazon | Adorama. 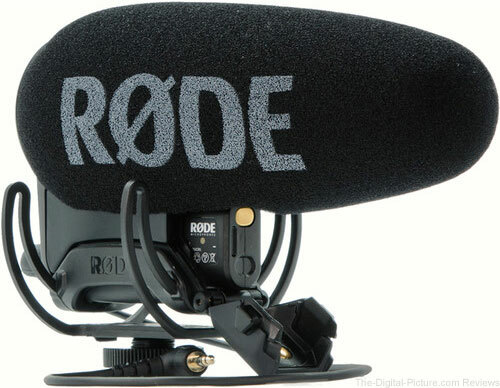 B&H has the Rode VideoMic Pro Plus On-Camera Shotgun Microphone available for preorder with free expedited shipping. The Canon Digital Learning Center has been busy compiling a great set of articles on solar eclipse photography, with two more articles – "Keeping It All In Focus" and "Spectacular Totality" – added recently. 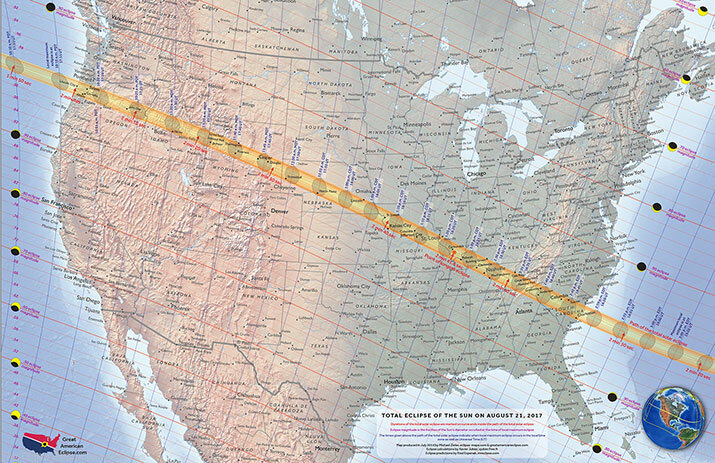 See below for the full list of solar eclipse articles available on the CDLC and also check out our review of the Meade Glass White Light Solar Filter.